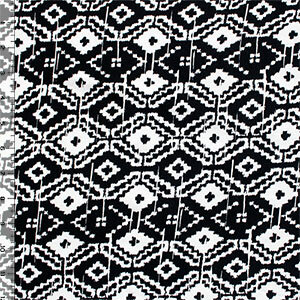 Super soft black and natural white vintage look ethnic ikat diamond eye design on a cotton rayon spandex blend knit. Fabric is very smooth, with a soft hand, light to mid weight, with a good 4 way stretch. Eye diamond measures 1 1/2" for scale.